Much of the province is, once again, under a blanket of smoke and haze — and there is little relief in the forecast. It's going to be another suffocating day in Alberta as smoke from wildfires in B.C. drifts east. Environment Canada expects the haze will last for several days. Air quality is expected to be intermittently poor for the remainder of the week as an estimated 600 wildfires continue to burn across B.C. A special air quality statement, issued by Environment Canada Wednesday afternoon, says the smoke blankets every region in the province. Four of Edmonton's five outdoor pools were closed Wednesday morning as a result of the smoky air conditions. The city's website says that a decision will be made at 1 p.m. whether to open the Borden, Fred Broadstock, Mill Creek and Oliver pools. The city is also expected to evaluate whether to keep the Queen Elizabeth pool at Kinsmen Park open. People in communities stretching from High Level to Cypress Hills Provincial Park are being asked to take precautions. The special air quality statement also warns people with pre-existing health conditions to take the following health precautions. Stay inside if you have breathing difficulties. Find an indoor place that's cool and ventilated. Using an air conditioner that cools and filters air may help. If you open the windows you may let in more polluted air. If your home isn't air conditioned, consider going to a public place (library, shopping mall, recreation centre) that is air conditioned. People may experience symptoms such as increased coughing, throat irritation, headaches and/or shortness of breath. Children, seniors and those with cardiovascular or lung disease, such as asthma, are especially at risk. Last week, Alberta Health Services issued a precautionary air quality advisory for the entire province. AHS said the advisory will remain in effect until further notice. 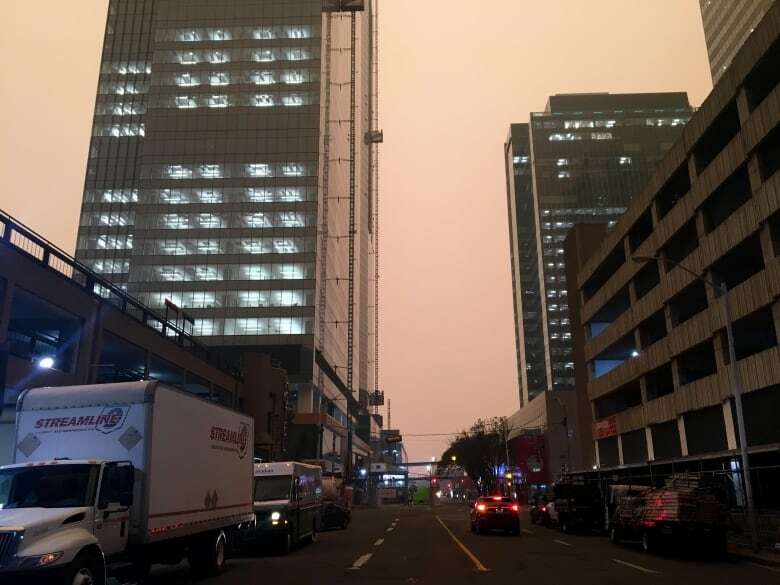 The forecast for Edmonton Wednesday included sunny skies, a high of 26 C, and a full afternoon of "widespread smoke." As of 7 a.m., the air quality health index for Edmonton was rated as 7, which is considered high risk for air pollution.